In late November 2017, as the Sarasota County commissioners worked to combat a projected budget deficit for the 2019 fiscal year, they talked with staff about selling county property that already had been designated surplus. 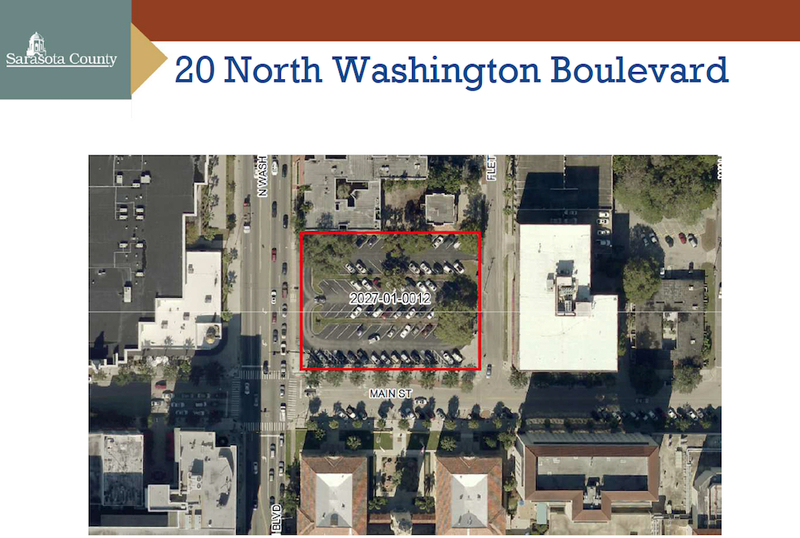 Among all the parcels the board members reviewed, they indicated the easiest decision was to market the county land located at 20 N. Washington Blvd., right across from the Historic Sarasota County Courthouse in downtown Sarasota. Although staff then estimated the sale could generate $3,950,000, the commission on July 10 ended up approving a contract with a limited liability company, Versaille St. Germain, for $3.3 million. Yet, the deal never closed, The Sarasota News Leader learned this week. And that may turn out to be of great benefit to the county, one commissioner told the News Leader. In late August, working through Grapevine Communications of Sarasota, Gray announced his plans for a new luxury hotel at 20 N. Washington Blvd. “For L. Ronald S. Gray, a decades-long vision of creating an incomparable luxury hotel is coming to fruition in downtown Sarasota. Hotel Laurent, his 10-story, 140-room passion project, is pending approval at 20 N. Washington Blvd.,” a news release said. 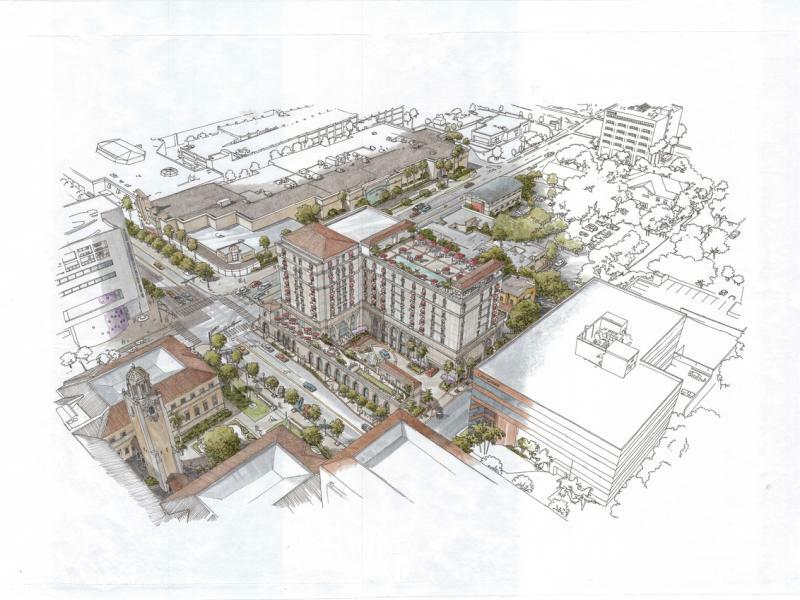 “To be built in conjunction with Sarasota-based Hoyt Architects and Gilbane Building Company, and internationally-recognized design firm, Cooper Carry, the boutique hotel will revitalize the east end of downtown’s Main Street, while offering discerning travelers a level of service and accommodations unrivaled in the region,” the release added. “Local ownership will allow for an innovative approach to hospitality not mandated by a corporate handbook and focused on individually tailored experiences,” the release continued. “All aspects of the brand will exude European-inspired opulence, from the lavish detail and styling to the attention to service and amenities. Preliminary plans include world-class dining options, a spa and gym, and a private concierge floor, club and rooftop pool,” the release pointed out. 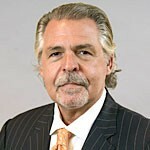 The release described Gray as a hotelier and a former New York investment banker. “He first came to Sarasota in 2002 and has frequented the area ever since,” the release added. “His affection for the city made it his ideal location to launch what he hopes will be a chain of similar hotel projects in Atlanta, Washington, D.C., and a host of other U.S. cities,” the release said. The July contract the County Commission approved with Versaille St. Germain gave the company 120 days to undertake due diligence on the property. As is commonplace in such documents, the contract also gave the buyer the option to terminate the deal “if in Buyer’s sole opinion the results of the investigations and inquiries are not acceptable. Buyer shall notify County within ninety (90) days after the Effective Date hereof of its election to terminate the contract and receive a refund of the Earnest Money Deposit,” the document noted. The “earnest money” was 5% of the purchase price. It was “due and payable to the County, or an Escrow Agent approved by the County, within three days of the Effective Date of this Contract,” the document said. Commission Chair Nancy Detert signed the contract on July 10. July 27: The initial escrow deposit was made, after two extensions were allowed — until July 13 and then until July 20. Oct. 8: The initial due diligence period ended. In August and September, Winchester continued, staff worked with the Office of the County Attorney “to edit the assignment of contract” from Versailles St. Germain to another firm, 301 Main Partners LLC. Florida Division of Corporations records show that 301 Main Partners filed its papers with the state on Aug. 6. The articles of organization came from the Band Law Group in Sarasota. The registered agent for the company is Gary Kauffman of the Band Law Group, which has its offices at 1 S. School Ave. in Sarasota. The mailing address is 555 S. Osprey Ave. in Sarasota, which is home to Red Property Management. Red Property Management’s website says the founder of that firm is Mindy Kauffman. She is the youngest daughter of Mark Kauffman, who has been involved in Sarasota real estate for decades, according to Sarasota Magazine. In 1997, the magazine reported, Mark Kauffman established Sarasota Commercial Management, which was the precursor to Red Property Management. Staff next received notice that Versailles St. Germain no longer wanted to assign the contract to 301 Main Partners, Winchester continued. “Following discussion regarding the escrow deposit being made by the assignee,” Winchester added, “the due diligence period was extended until Nov. 9, 2018, to give the buyer time to make the replacement deposit and not be in breach of contract. “We wish you the best of luck in all your future endeavors,” Lewis concluded the letter. Over the past year, Hines reminded the News Leader, Sheriff Tom Knight has advised the County Commission on several occasions about concerns regarding the climbing jail population. On Oct. 23, Knight reported that the population was up 12% year-over-year on Oct. 10. While the operational capacity of the facility is 867, the inmate count on Oct. 10 this year was 1,042. Because of the need to separate female inmates from males, and juveniles from adults, for example, the Sheriff’s Office Corrections Division has been working hard to manage the situation, Knight told the commissioners. He stressed that he did not want to have to build a new jail. 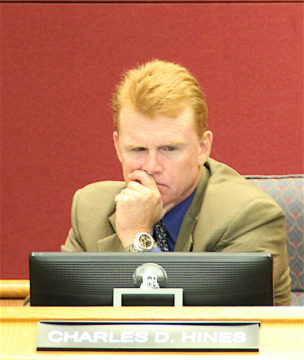 Yet, on Nov. 7, Commissioner Michael Moran raised the issue during the board members’ reports. 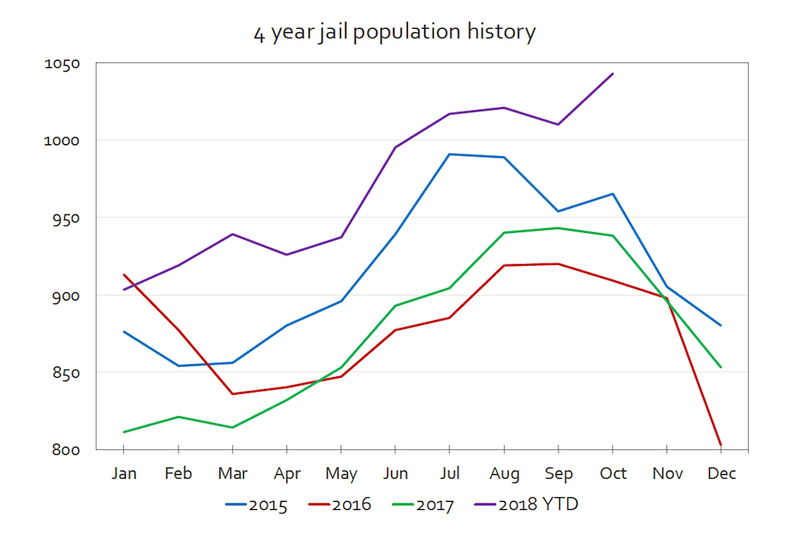 If jail diversion programs — including three new ones the commission agreed to fund this fiscal year — do not lead to a significant reduction in the jail population, Moran said, the board could not construct a new facility in a short time frame. He called for a workshop discussion about how best to proceed. 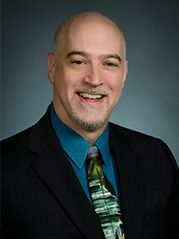 County Administrator Lewis suggested such a session in early 2019. When the board members talked about the potential revenue from the property in November 2017, Hines noted, the board members also were facing the prospect of another Florida homestead exemption passing on the Nov. 6, 2018 General Election ballot. They feared the impact on future county budgets if they lost the associated property tax revenue. Yet, while all the other proposed state ballot measures and even County Charter measures passed, that homestead exemption failed. On Nov. 5, Hines told the News Leader, “I would have said, ‘I know if anything’s going to pass, it’s that [one],’” referring to the extra $25,000 homestead exemption, listed as Amendment 1 on the ballot. 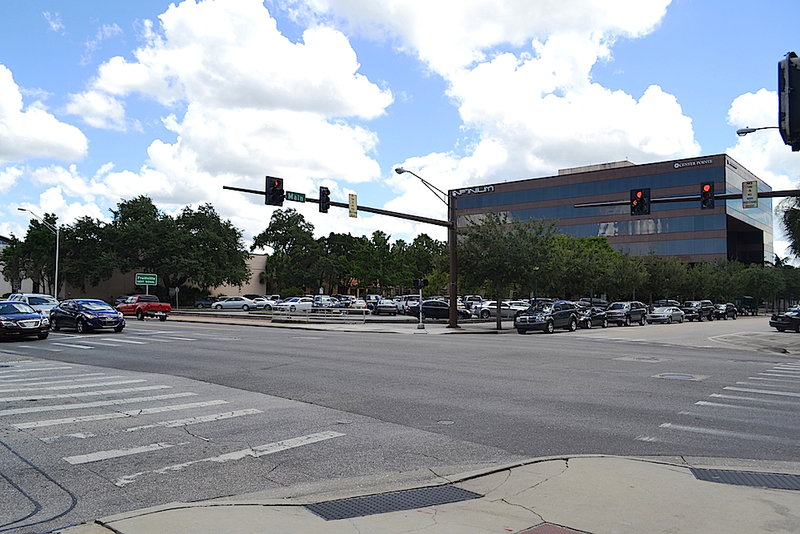 As a result of the breathing room afforded by that decision, he continued, the Sarasota County Commission is in a far different position than it was on Nov. 28, 2017, when he called for getting the 20 N. Washington Blvd. parcel sold as soon as possible.